The Nixon Mission Android Wear smartwatch is designed with one purpose in mind — not breaking when it’s being abused by the surfers, tough-mudders, skiers, and other super sporty types who should be attracted to it. However, the rugged body and silicone strap look less at home matched with anything smarter than sportswear. 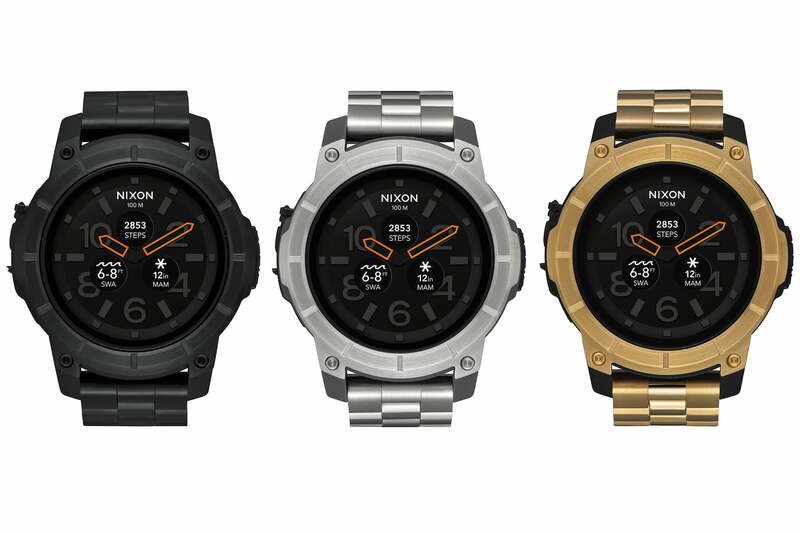 Nixon’s solution is the Mission SS, three new versions of the smartwatch with metal straps. It’s called the SS for a reason — the silicone strap has been swapped out for a 23mm stainless steel (SS, see?) three-link bracelet with a locking clasp, in black, gold, or silver with a matching body. The metal band adds class and style, while still maintaining the strength and durability needed if the Mission is used as intended. The bezel around the watch face is also made of stainless steel, matched to a polycarbonate casing, and a Gorilla Glass crystal over the screen. This external toughness is matched with 10ATM water resistance, or to a 100-meter depth, yet the watch still has a microphone for Google Assistant voice control. Nixon uses a protection system called MicLock, which is a cover that needs to be secured over the mic before putting the watch in water, to keep the insides dry. It’s Android Wear 2.0 installed on the Mission SS, while the original Mission watch shipped with Android Wear 1.5 onboard. Nixon pre-installs a pair of apps, both related to snow and surf activities. The 48mm Mission SS smartwatch uses a Snapdragon 2100 platform, and has the same 1.39-inch AMOLED screen as the original Mission, with a 400 x 400 pixel resolution. Nixon has the Mission SS watches ready to buy through its website now. All three versions cost $425, or $25 more than the Mission watch with a silicone strap. However, it’s not included in Nixon’s customization plan, where the bezel, band, face, and inscription on the rear can all be altered to your preference. The Mission and Mission SS smartwatches are built with a purpose, and compete in a niche with very few other full Android Wear products. If you’re looking for a smartwatch that doesn’t need such specific use, take a look here at our picks for the best smartwatches out now.